Here’s where I’m starting from. We elect our legislators to legislate. I expect them to do it. When a measure comes from the legislature for an issue that requires the citizens vote on it, I start with a biased “yes” position; the people we hired to legislate are recommending that we do this thing. When a measure comes from the legislature simply because they are too chicken to legislate, I start with a biased “no” position; the legislature should do the job they were hired to do and not make us do it for them. Only props 1, 2, and 7 come from the legislature. Props 1 & 2 require voter approval (involve issuing bonds). More on 7 below. It’s tougher when a measure come from a citizens’ initiative. It looks like direct democracy. The only problem is that it isn’t. First, there is no opportunity to amend the measure. All we get to do is vote it up or down. True democracy involves an intermediate step of “perfecting” the measure or motion through the amendment process. We don’t get to do this. Second, with the massive amounts of money it takes to get something on the ballot and then to campaign for it, you know special interests are involved. Money is one of the corrupting influences in American politics. So I start from a biased “no” position on citizen initiatives. Here are just a few sentences on why I’ve come to my position on each Proposition on the ballot. Prop 1: Yes. There are far too many people unhoused in California and the numbers of unhoused people are rising. Money is needed to build more housing. This measure comes from the legislature. It gets my support. Prop 2: Yes. This comes from the legislature and cleans up Proposition 63, passed in 2004, so Prop 63 can actually fulfill its promise. Prop 3: No. This is the latest costly water bond measure, measures that have failed to address the state’s water shortage. Prop 3 fails to fund any new dam construction, which I think is necessary to address future droughts. If these bonds for these purposes are necessary, then the legislature should write a similar bond measure for us to vote on. Prop 4: A soft No. This proposition comes to us from the California Children’s Hospital Association. The money these bonds will raise are for children’s hospitals. If this public money is truly needed, the legislature should write a similar bond measure for us to vote on. Prop 5: No. As the California Council of Churches points out, this is so poorly written it will almost certainly end up in court being litigated rather than actually going into law. This seems to me to be a lawyer employment plan. Prop 6: No. We should be taxing gasoline and diesel at higher amounts (to encourage people to stop using it), not removing the small taxes we already have. Prop 7: Yes. I grumble every time I have to change the clocks because of Daylight Savings Time beginning or ending. We should be on Daylight Savings Time year-round. It’s a pity that this proposition only give the legislature the power to make the change and doesn’t just do it. Prop 8: Yes. It’s a pity that this initiative was necessary to curb this form of run-away healthcare costs, but the legislature didn’t act. This so clearly serves people, especially people in need, it gets my support. Prop 10: Yes. Cities need to have the power to create rent control laws. 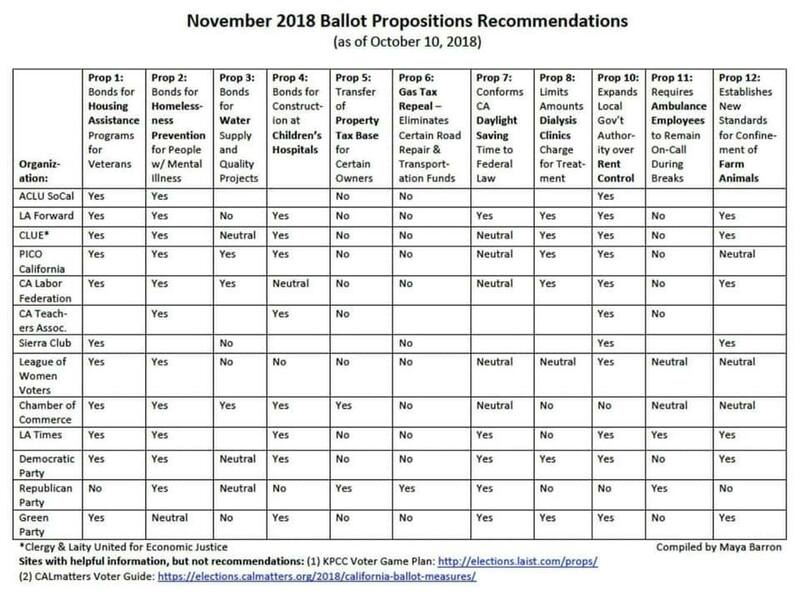 Prop 11: No. Look at who’s funding this – American Medical Response. They want to get out of some labor-related law suits and not have to pay EMTs and EMT-Paramedics when they are on call and not responding to a need. Prop 12: Undecided; leaning yes. Proponents argue that Proposition 2 (2008) was too vaguely written to protect animals. While it stated that animals must have room to lie down and move, it did not list specific area requirements. Proponents claim this vagueness has allowed producers to continue to cram animals into cruel spaces. They say this measure will clean up the law by laying out precisely how much space animals must be provided. Opponents claim this is another poorly written law that will not actually protect animals, particularly chickens. They say that while Proposition 2 (2008) did not specify measurements, it mandated enough space to move, lie down, and spread wings, etc., while now Proposition 12 allows much smaller spaces. In particular, they argue that the one-square-foot of space requirement for chickens is still too small. This grid was created by Octavia Tuohey and posted on Facebook. 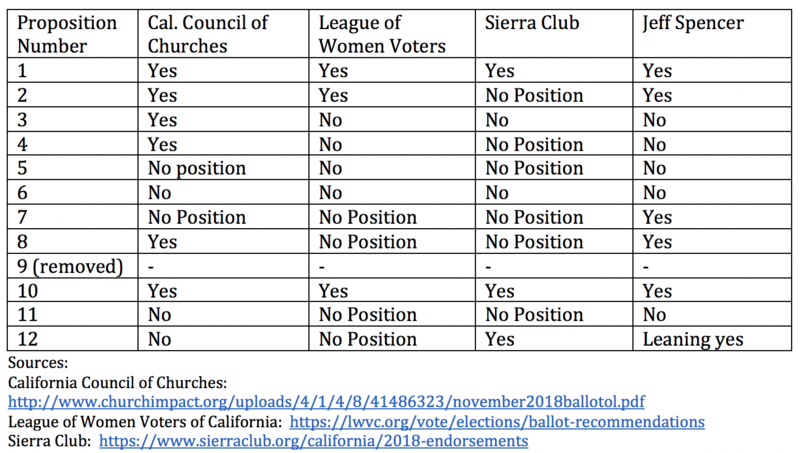 I have not fact-checked it, but she got the League of Women Voters and the Sierra Club correct.